New. 028945258829 Still in shrinkwrap. Sergey Prokofiev. Very Good. In very good packaging. 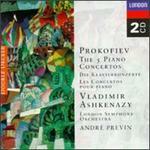 Prokofiev: The Piano Concertos 1-5.